luxury Durham letting situated in the centre of Durham City provides excellent, spacious, quiet and flexible accommodation for up to 4 people as a great alternative to a hotel or guest house that is a mere 3 miles from the A1(M) motorway and 800m from Durham’s mainline train station. Travelling to the North East on business then Riverside Retreat with its secure parking and own ground floor private entrance is your perfect base, with its close proximity to motorway links and the train station making it an easy and short commute to Newcastle, Sunderland, Darlington, Aycliffe and Middlesbrough. The accommodation offers 5 star luxury and high speed broadband in a picturesque riverside setting close to restaurants, bars and all other City Centre amenities. Riverside Retreat is only a short walking distance to many of the Colleges in Durham University’s Durham Campus and only a few minutes from all others. Durham University’s Queens Campus Stockton is only a 20 minutes away by car. Situated in Clements Wharf in the centre of Durham Riverside Retreat is a luxury flexible accommodation for 4 people popular with family and others visiting students attending the University or coming to Durham University’s numerous open days. 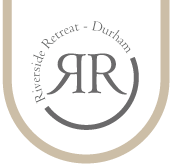 Riverside Retreat is a highly sought after luxury accommodation for those coming to the Durham University Graduation week’s in January and June as a better alternative to a hotel or guest house. With its very close proximity to the Gala Theatre (only 100m away) Riverside Retreat is the ideal accommodation or ‘digs’ for artistes, acts, research staff and others appearing at, or working at the Theatre, who want a secure, private and quiet short or longer term letting. As it can accommodate up to 4 people (and it’s second bedroom can be configured to twin accommodation if preferred) it’s an ideal accommodation for customers of the Gala Theatre close to restaurants and bars perhaps as part of a short break or city break. Durham has over 70 key attractions each year and Riverside Retreat is superbly positioned to enjoy them all. Whether you’re visiting the DurhamLumiere – UK’s largest sound and light show, the Miner’s Gala, Durham Regatta, the Brass Festival, Book Festival, Summer and Winter festivals or any of the other many events taking place in the city Riverside Retreat is within walking distance of each and every event. Visiting Durham to see its beautiful Castle, Cathedral and the UNESCO World Heritage Site then Riverside Retreat, luxury letting is a mere 300-400m or 5-8 minutes walk away along picturesque winding cobbled streets. Perhaps you prefer a leisurely stroll along the riverbanks, a spot of lunch, or a quiet drink as you enjoy the ambience of beautiful Durham City, Riverside Retreat is ideally situated to do all of this. Riverside Retreat is a superb base to visit the many award winning attractions across Co Durham such as Beamish Museum, Kynren and Emirates Riverside Circket Ground which are all only a few miles away. Prefer to shop then Metro Centre Gateshead is only a 20 minute drive by car and Newcastle with its large department stores can be reached in 15 minutes by train. As a private, quiet and flexible ground floor riverside accommodation for up to 4 people, with its own entrance, riverside location and secure parking Riverside Retreat is the perfect base to enhance any visit to Durham or the North East whether this is on business or for pleasure. Keep up to date with all our latest offers and promotions.